Waiting for astronomical twilight at the Winter Star Party near Big Pine Key, Florida, on February 24, 2017. 1 March 2017. The Moon returns at the beginning of March in the form of a slender waxing crescent in the western sky after sunset. It’s joined by the fading but still respectably bright planet Mars and the unmistakable silver-white radiance of the planet Venus. Uranus lies 2º west of Mars and reveals itself easily in a pair of binoculars. These three planets are a study in contrasting brightness. Venus shines at magnitude -4.6, Mars at magnitude +1.3, and Uranus at magnitude +5.7. The Moon today has a total magnitude of -9.0. Each full step in magnitude is a factor of 2.512 in brightness. Watch Venus in particular this month. The planet will start from its current position about 30º above the horizon and plunge over the next four weeks towards the Sun on its way to inferior conjunction. During this time, in a telescope, you can see the planet’s crescent shape grow ever more slender. The waxing crescent Moon, Mars, Uranus, and Venus in the western sky after sunset on March 1, 2017. 4-5 March. The nearly first-quarter Moon passes in front of Aldebaran, the brightest star in the constellation Taurus, for observers in much of the United States, Mexico, the Caribbean, and Central America. The star will disappear behind the dark edge of the Moon, then reappear from behind the lit edge. The show is visible without optics, although binoculars will give you a better view. The occultation begins, for example, in Seattle at 7:21 p.m. local time, in Chicago at 9:57 p.m. local time, and in Washington D.C. at 11:04 p.m. local time. You can get times for more cities at this link. 12 March. Daylight savings time begins in much of North America. Prepare to be a little more tired than usual today. 14 March. Look for bright Jupiter, the star Spica, and the waning gibbous Moon rising in the east or southeast at about 10 p.m. Jupiter is now well situated for observation as it moves towards opposition next month. It grows to magnitude -2.5 and an apparent diameter of 45″ by month’s end. The waning gibbous Moon, the star Spica, and the planet Jupiter at around midnight on March 14-15, 2015. 20 March. 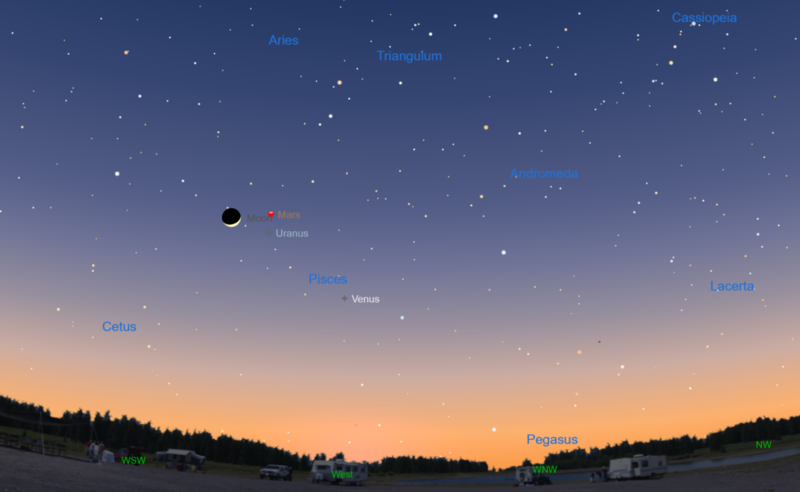 Look for the last-quarter Moon just 3º from the planet Saturn in the southwestern sky a couple of hours before sunrise. Saturn, which lies in Sagittarius, is slowly brightening and growing larger. It shines at magnitude +0.4 at the end of March. 20 March. Spring begins in the northern hemisphere and autumn begins in the southern hemisphere at 10:29 UT. This astronomical event is marked by the Sun crossing the celestial equator moving northward. A waning Moon and the planet Saturn rising at about 4 a.m. on Marhch 20, 2017 in the constellation Sagittarius. 25 March. Venus reaches inferior conjunction (it lies between the Earth and Sun, though slightly out of plane). It will reappear in the morning sky in the coming weeks. 26 March. The planet Neptune just grazes the northern edge of the very slender crescent Moon, which is visible in the eastern sky before sunrise. (NOTE: All sky simulations are created with SkyX Serious Astronomer edition from Software Bisque).